Operate on Longitude & latitude parameter of location with month wise settable civil twilight time. And realtime clock with 10 years of life as per manufacturer and saves up to 8 % energy again manual operation or motorised timer or Annual programable timer, or Photo switch And addition to 50 %enrgy can save while with settable power down mode when there is low traffic time. Save cable cost compare to staggering mode. Over and above GSM based total remote monitoring and controlling system at very low operational cost. Also its avoid dark patches. All above opeartion with protetction against Over and Under voltage and Over current & sort cercuit protetcion. See our Ad. on Infomedia Yellow pages. Low annual operating cost type GSM base are among the most inexpensive wireless technologies available. Low initial costs As GSM wireless; there is no need to establish cable connection less installation time. Required no government licensing for wire less system. Remote monitoring parameter setting and control through GSM with City light software. Staggering / power down mode selection. Power wiring of feeder pillar with fire retardant and heat resistance cable. 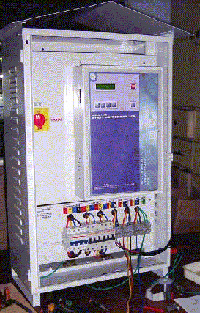 Settable time power saver facility to reduce the power at late night and again restore in morning. (Save energy when no traffics. Even in single phase systems will work. ( In built Protection for energy saving device. Power redundancy for controller even 1 phase 170 VAC controller can work. Auto Calibration of Systems for monitoring Load current for protection. Over and under voltage cut off user settable. Saves lamps and energy. Auto resetable over voltage and under voltage cut off. Over current trip in % is user settable. It has special function to store load current of each line & channel in memory. When over load will be detected it will trip that particular phase. Dimming (Power down) mode selection switch on/off at fixed times. Night dimming / staggering and intelligent control reduces burn hours and increases the lifetime of lamps with 30-40%. Low initial costs As GSM wireless, there is no need to establish cable connection. Wireless technology based GSM technology the system requires no cabling and is easily expandable to new areas and cities. Control from mobile phone For service purposes Citylight can also be controlled from a GSM phone using SMS technology(Optional). Remote switching through SCADA software to override local controller. Emergency Stop / ON of feeder pillar From centralize systems. Control at any level of individually Street lights. Fast detection of errors with GSM the street lights are always online any fault in street lighting electrical circuits is known to the operator within sort time. Constant monitoring and logging of switching on time, RTC data, electricity parameters and faults. Reports can be generated as per user requirements. Citylight replaces visual inspections of individual street lighting with sitting at office. Also by fault alarm and monitoring of data user can judge the fault status and severity of fault. Energy savings combined with reduced maintenance costs are prime benefits of street light control and management. Scada software named Citylight is based on advanced use of global technologies such as GSM & real time embedded systems. Parameter data protection With special device which hold the data for more then10 years without any power and Password protected. CITY LIGHT: PC based Citylight lights management software which controlled on line / off line street light operation, maintenance management and emergency on or off street light with GSM base technology. An efficient replacement program for maximum use of each luminary can be based on precise data of line current and voltage. Faults in individual electrical circuits are reported automatically, eliminating the need of costly visual inspections. Periodically collect the data of Voltage, Amp, VA,PF, etc as per user requirement.